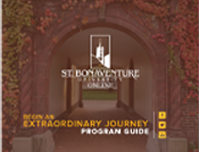 St. Bonaventure University Online is a decision you can afford to make. Continuing your education at the graduate level is a big decision. It involves a commitment of time and resources, but research consistently shows that the investment is quite worthwhile. Not only do graduate degree holders enjoy higher salaries, but they also enjoy greater job security and career portability. Our goal at St. Bonaventure University Online is to make a private Catholic-Franciscan university education available to as many students as possible. We understand that education is an investment in your future; we also realize that cost is an important factor, so we offer our online graduate degrees at an affordable rate. We also award aid based on need. Please note that the cost to complete your graduate degree depends on the number of credits you are transferring. Below is an estimated total cost to complete a graduate degree program at St. Bonaventure University Online. We will work with you to help identify the different financial aid options available to you as an online student. We have researched and compiled information that can give you an idea of the financial benefits for which you may qualify, including student aid and military discounts. Learn more about financial aid now. "One aspect of the program I did not expect from an online course was the constant communication with classmates. I sometimes referred to the program as a master’s in my pocket. "